Hello, welcome to the Weather Forecasters, here is our daily smore for you. Today the 20th of May here in Juneau at 6:34 a.m., we are experiencing cold weather at freezing point, 32º F with no wind chill. It’s partly cloudy with scattered patches of fog, and sunshine peeking through at places. We’ve have had 0.00” of precipitation here but the barometric pressure is surprisingly a 30.51 with 100% humidity because of the large amount of water vapor in the air. The ground is glazed with a thin layer of ice, but there is no dusting of snow. What an odd day! We can see mostly Cirrocumulus and Stratus clouds from our Weather Forecaster Station. Grab your hats, gloves and a toasty, warm cup of hot chocolate and prepare to snuggle up, because this is going to be a mildly cold and murky day! 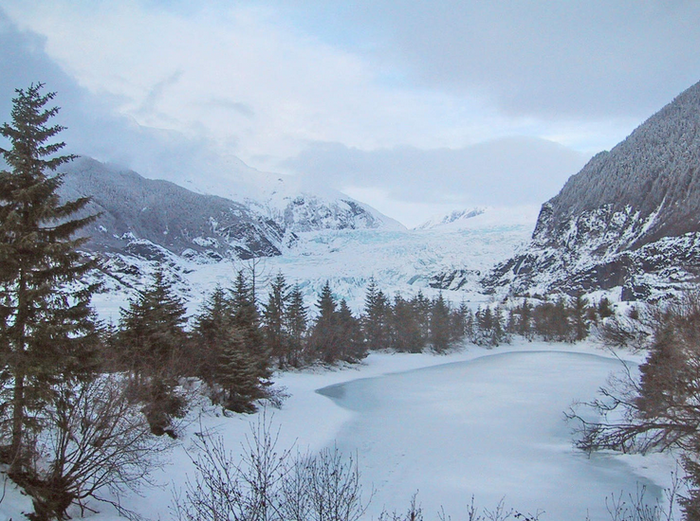 This is what it looks like in Juneau during the wintertime. Ponds are frozen over and trees have a nice dusting of snow. This is Alaska's Mt. McKinley. 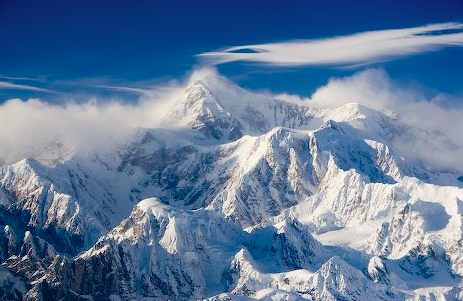 It is the highest point in Alaska at 20,320 ft. above sea level. 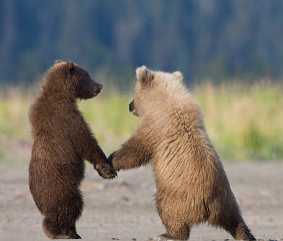 In the summer, Juneau is full of life, including these baby bears. Most of Alaska is surrounded by water. To the north is the Arctic Ocean which consists of the Beaufort Sea and the Chukchi Sea. 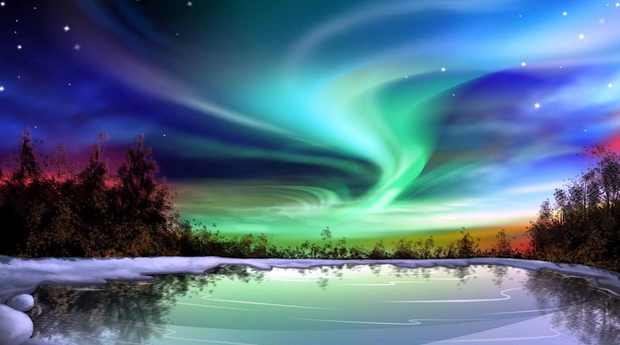 To the south of Alaska is the Gulf of Alaska and Pacific Ocean. To the west is the Bering Sea. All of that water combined makes Alaska have 86,051 square miles of itself covered by water. This all impacts the weather by having all the water evaporating and causing a lot of humidity. 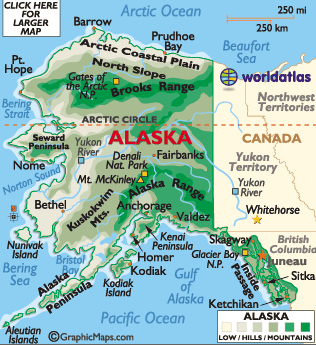 Also, Alaska can become cold because it’s 54º in latitude, making it colder. In fact the average monthly temperatures range from a high of 71.8 degrees to a low of -21.6 degrees. That's a large range! Lastly, all of Alaska’s mountain ranges (that have an altitude of around 20,000 ft) that have thinner air which doesn't allow it to hold heat. All of the oceans surrounding Alaska, keep Alaska cold too. 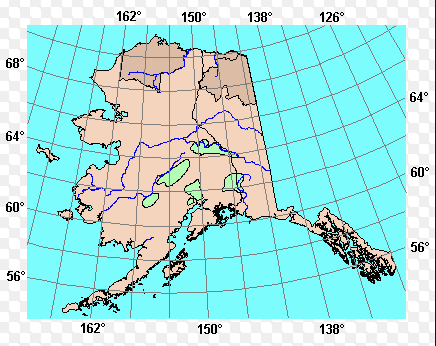 This is a map showing Alaska's elevation - mountain and hills. The darker the color, the higher the elevation. 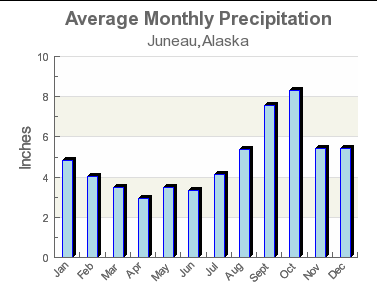 This is a graph showing the average monthly amount of precipitation. This is a map showing Alaska's latitude - how far it is from the equator.